Embrace sophisticated, contemporary styling, with this effortlessly chic sterling silver chain bracelet adorned with rich and romantic rose gold-plated multi heart stations. Wear alone, or try layering with other bracelets for a statement look. 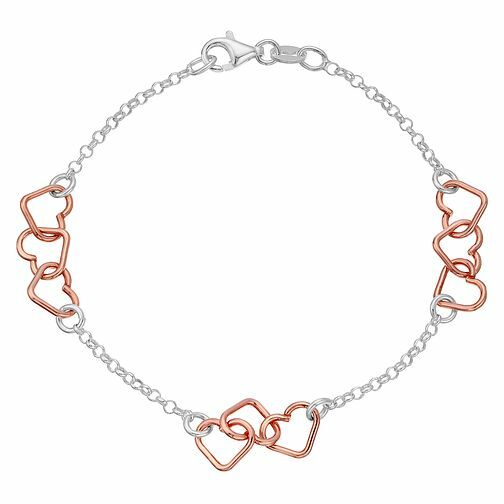 Sterling Silver & Rose Gold-Plated Heart Station Bracelet is rated 4.3 out of 5 by 3. Rated 3 out of 5 by Anonymous from Very Pretty I would have given the product 5 stars however one of the posts of the ear rings was damaged! As I didn't check the posts and had wrapped and handed it to my daughter for mother's day I had no way of returning it! Disappointing to say the least. If this had not happened in would have been immensely pleased as it is a very pretty set. Rated 5 out of 5 by Anonymous from Made a little girls day Gave this as a present for a 10 year old and she absolutely loved it - made her day.